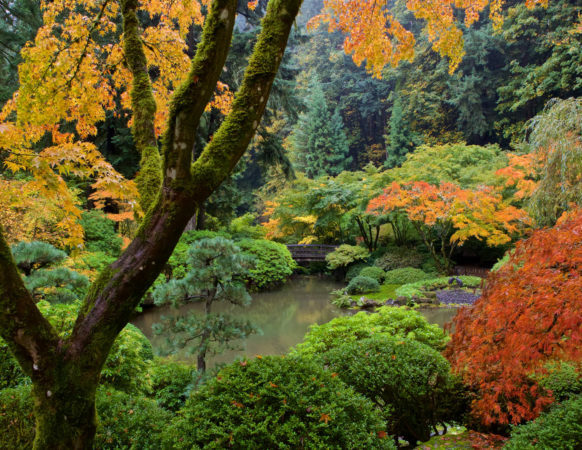 A Japanese tea garden [cha-niwa or roji] is a place for quiet reflection on the beauty of nature and the art of living in harmony. 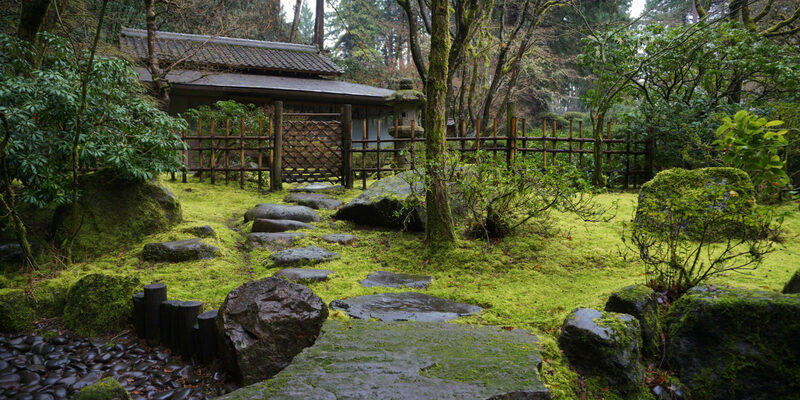 A pathway of carefully placed stepping stones, lined by lanterns, leads through the rustic garden to the tea house. Tea gardens were historically designed as peaceful, natural spaces to detach oneself from the hectic everyday world before entering the tea house and the tranquil world of tea ceremony [chanoyu]. The tea garden is appropriately more rustic than most other garden styles. This is particularly evident in the use of naturally shaped stepping stones. Tea gardens were the first kind of garden in which stepping stones and lanterns were used. The experience of walking through the roji path to the tea house is meant to give a sense of traveling a considerable distance: out of the city and deep into the mountains to the hermitage. As guests walk the winding path, their cares drop away and they arrive at the tea room composed and serene. 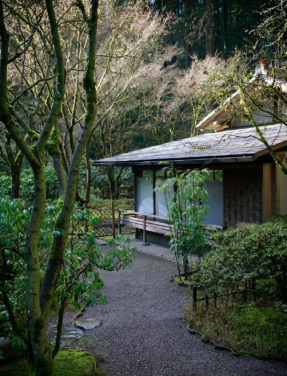 The Tea Garden consists of inner and outer gardens, connected by a pathway [roji] that leads to the Kashintei Tea House. The outer garden path [soto-roji] stops before the waiting place [machiai]. Here, the tea ceremony host would greet visitors and invite them to walk the inner garden path [uchi-roji]. Guests would pause at the water basin [tsukubai] to rinse their hands and mouth, symbolically removing the dust of the real world behind. 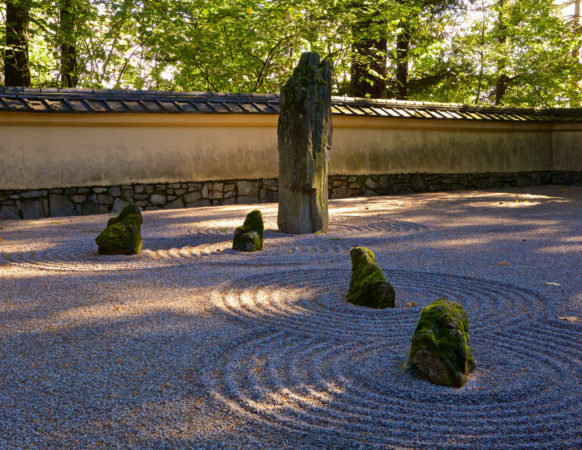 The pathway through the gardens represents a journey so integral to the Japanese tea ceremony that the word roji has become synonymous with tea gardens themselves. Kashintei (literally “Flower-Heart Room”) is the name of the authentic Tea House that sits in the heart of the Tea Garden. The structure was made in Japan, shipped in pieces, and reassembled in the Garden. Tea houses are composed of several strictly defined spaces: the anteroom [mizuya], where the utensils for the ceremony are readied beforehand; the sitting room [zashiki], where the tea ceremony is performed; the alcove [tokonoma]where flowers and a calligraphy scroll are displayed. Four-and-a-half tatami mats, which are the standard dimensions of a traditional tea house, cover the floor. Although the Tea House is an authentic structure, it also features unusual elements, including walls of sliding papered doors [shoji] around the tatami mat area, a surrounding slate floor, and outer walls of sliding doors. These changes make the Tea House useful for tea demonstrations as well as tea gatherings in the Garden.